...this dude might be in some trouble in the Swamp Saturday! * And Greggy G doesn't care how many Gator starters are out! I know it’s only Wednesday, but I’ve been ATS-eyeballing the Florida/Hawaii match-up since June Jones mysteriously left for SMU. First-off, what the hell was the former Chargers headmaster thinking? 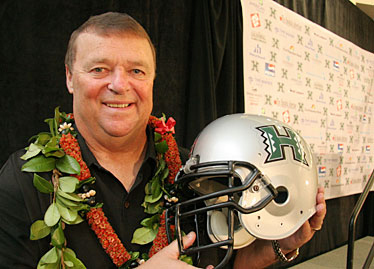 He coached with a LEI around his neck on a gorgeous island with no expectations, and decides to leave for a Methodist University with a program that hasn’t made a bowl appearance since 1984 for a couple extra bucks. To-Each-His-Own I guess, but I think that car accident back in 2001 did some damage to June's noggin. Not since waking-up religiously to watch workout wonder KIANA TOM was there been any reason to follow Hawaiian sports, surfboards aside, until Jones arrived to the island (BTW, watching Kiana's video & OTHERS makes me angry. How the hell does ESPN have 50 channels and no love for the workout girls...those sexist pigs!). Thanks to my man June, my two newts are named “Timmy” & “Chang”. That being said, maybe Jones knew this year was going to be a disaster for the Warriors with only four offensive & five defensive starters returning. 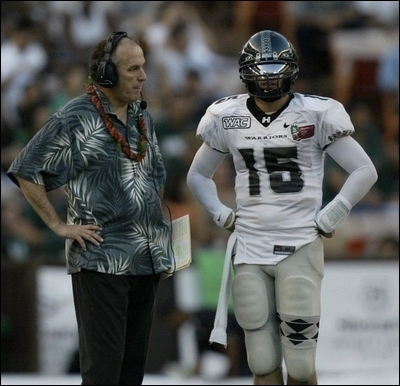 Hawaii made a solid hire by signing a former coach under Jones in the well-traveled, well-accomplished defensive coordinator Greg McMackin, but considering the cupboards are bare on the coaching staff as well (June took all the goodies with him)…it’s gonna take some time. At least in Hawaii you could try to distract the Gators! 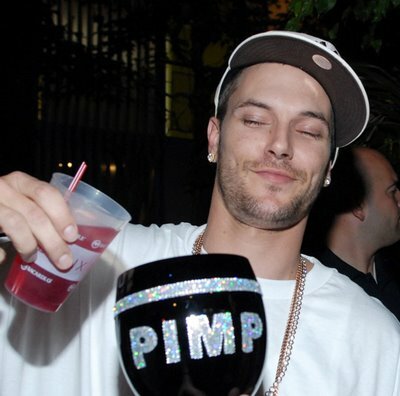 Sorry, didn't mean to do that...and u don't look like K-Fed. 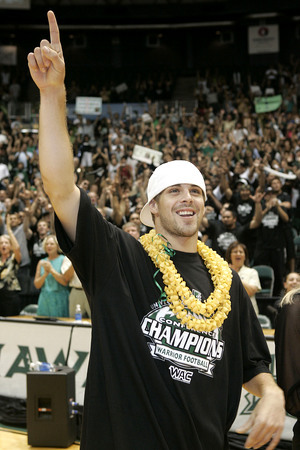 So without cult hero Colt Brennan, his four starting WRs from last year, and basically the entire defensive line & starting corners, the Warriors fly across the globe to Gainesville to face an angry group of hopeful '08-09 National Champions. Nobody is stockpiled with more ridiculous size, speed, & strength than the Gators, and ever since Georgia scored a TD & proceeded to have their entire team run on the field for a dance, Urban Meyer looks like a crazy brother ready to kill a dude that stovepiped his sister. Throw-in Heisman Trophy winner Tim Tebow and the slew of skill-position players that will be three times as explosive as what the Warriors have seen in camp, & I’d be shocked if Florida doesn’t score at least nine touchdowns. Just like trying to use one hand to cover, the Warriors have no chance to cover using only one QB at a time! On the offensive side of the ball for the Warriors, let’s just say Coach McMacklin might have some ill-will towards junior college transfer Brent Rausch because he’s the supposed starter. The poor sophomore has absolutely no collegiate experience besides a season at the College of the Desert (no joke, the College of the frickin’ Desert! ), and will be opening his D-1 career in the Swamp! Seriously Mr. McMacklin, unless you’re lying about who’s starting, how they hell do you not open the season with one of the two signal-callers with some actual experience? Considering the Gator defense has been blamed for last season’s horrific three-loss campaign, I’m not exaggerating when I say this, but I can not fathom how young Rausch will have time to complete more than 10 passes before he leaves on a stretcher...and down 50! Considering Timmy T & the boys are used to running through the big boys, the five returning defensive starters for the Warriors might be in a lil trouble! The line opened at Florida -32 & already moved to 36, but don’t lose much sleep if it moves to 45 by the time u read this. Tebow & Co. will score a TD on every single drive until they're pulled early in the 3rd, while the 2nd string will be even sharper as they look twice as fast & strong with the worn down Warrior squad looking for the exits. BTW, when you finish reading my Pigskin Pick, don't forget about my MLB ATS PICK & MORE HOTTIES FOR TODAY!!! They only thing the Warriors can hope for is that she hasn't graduated and looks even hotter outside! While some things look great in Red...Josh Fogg doesn't! This page contains a single article from August 27, 2008 12:07 PM. The previous days article was Fantasy Pigskin, Daily ATS Picks, & Babes.